A category four equal-angle driveline is available on all three models and a category four constant-velocity driveline is available on the RCR2510 models. 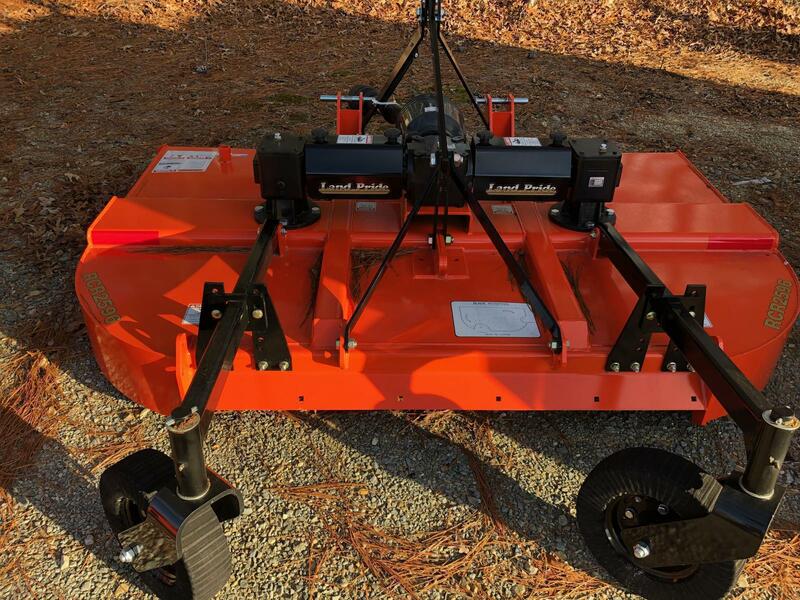 Pull-type or 3-point hitch models are available in all three configurations. Stump jumpers, main driveline slip-clutches, and outboard flex couplers are also offered for driveline and gearbox protection. Safety shields around the cutter are offered in either chain or rubber. Gearbox HP rating: 120 Horsepower on splitter gearbox and 60 HP on outboard gearboxes. Splined rubber flex- couplers between the center and outboard gearboxes: Protects the driveline and gearboxes from hard objects in the blade path. Constant Velocity U-Joint option on RCR2510 Pull-type: Reduces chatter and extends life of U-joint during turns. 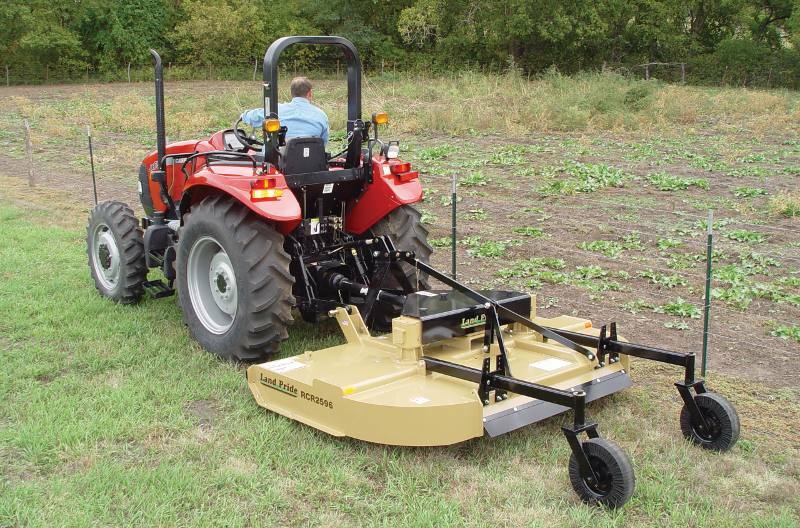 3-Point or Pull-type: Pull-type fits older tractors without a top link or smaller tractors without enough lift capacity. High productive cutting width: RCR2596 cuts 8’-0” width. 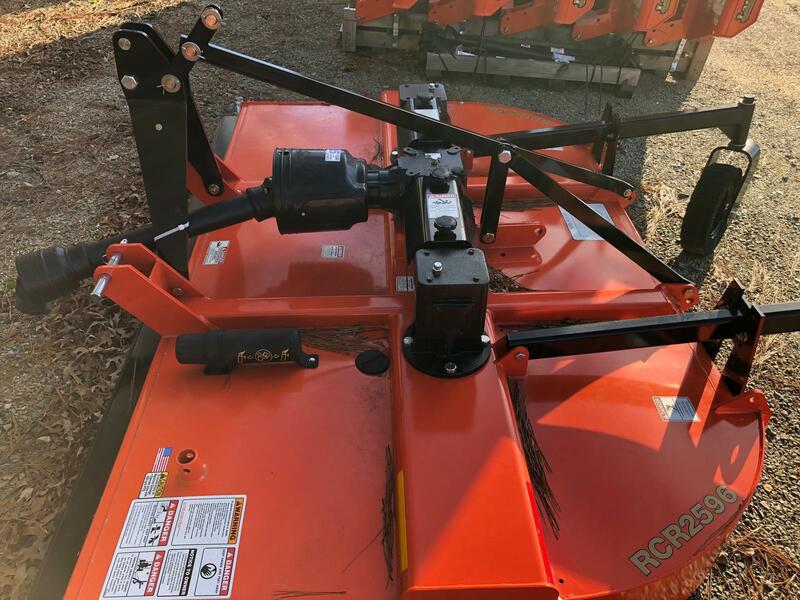 RCR2510 cuts 9’-10” width. Fully welded 10 Gauge deck: Fully welded deck adds rigidity. 3/16” Sidewall thickness: Protects sidewalls from thrown objects. Obstacle free underside: Underside of deck is free of reinforcement members which tend to allow material to lodge. Dual leveling rods on Pull-type: Dual leveling rods eliminate deck twisting when going over uneven terrain. Chain or rubber shield option: Reduces flying debris. Full length skids with replaceable shoes: Adds reinforcement to side panels. Replaceable shoes allows for change before wearing through to weld-on piece. 3/16” Round stump jumper: Standard stump jumper aids in sliding over obstructions, which helps protect gearbox output shaft. 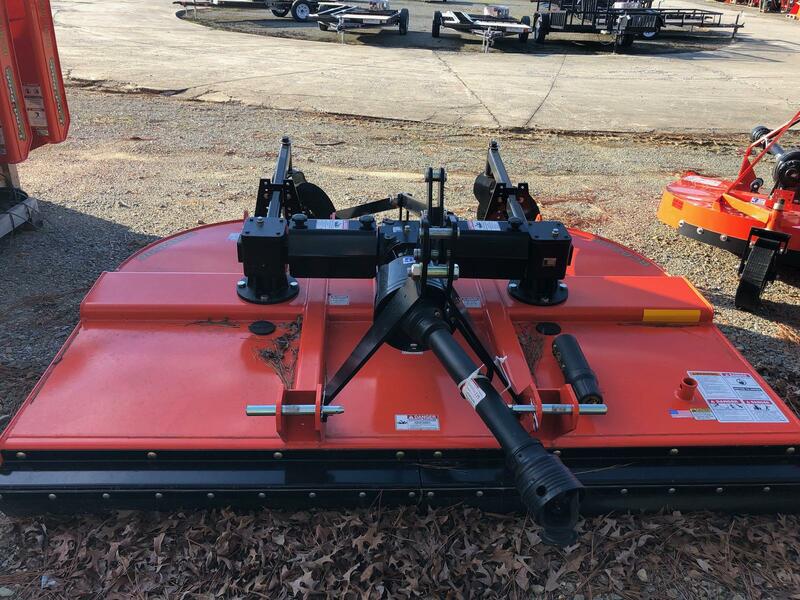 1” x 4” Blade bar: Heavy-duty blade bar adds support to stump jumper as well as gearbox output shaft. 1/2” x 4” Heat-treated blades: Heat-treated blades last longer than non-heat-treated blades. 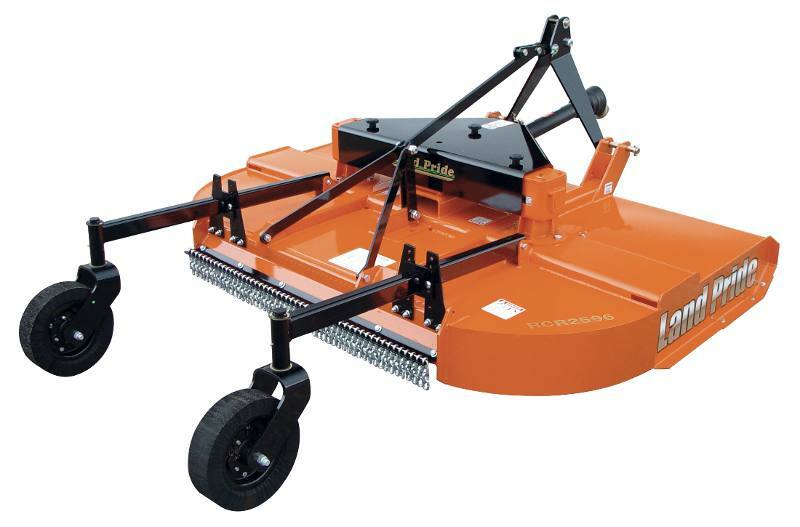 1.5” Diameter cutting capacity: Aids in cutting small brush. High Blade tip speed: RCR2596 (540 rpm) = 14,792 fpm RCR2510 (540 rpm) = 17,749 fpm Means Cleaner Cutting of material. Laminated tires: Laminated tires can handle almost any condition. Airplane tires (Pull-Type only): Airplane tires offer smooth roadability. Machine Weight (With Front and Rear Chain Shields): 1,380 lb. Cutting Width: 7 in. 10 in. Overall Width: 8 ft. - 3 3/4 in. Overall Length: 8 ft. - 6 in. Deck Height: 9 5/8 in. Gear box Input/ Output Shaft Size: Input Shaft = 1 3/4 in. - 20 Spline, Output Shaft = 2 in. Dia. Stump Jumper: Round Pan 3/16 in. 8 ft. 3 3/4 in.